Although Shire redeemed a first half to forget after which they trailed Spartans 4-1, the eventual 4-3 defeat still leaves them just four places off bottom side Whitehill Welfare, with any thoughts of closing the gap at the other end now just a distant dream. Ure remains convinced he does have the players at the club who can make the necessary improvements to their current position, but he is in just as little doubt that his squad is underachieving and they must begin playing to their true abilities soon. 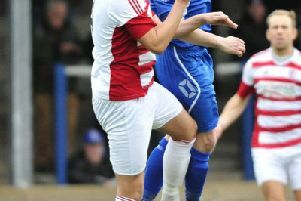 Shire have shown regular flashes of what the team is capable of but have been unable to build on the fleeting good result. In the three years since their demotion from the SPFL they have gone from being the team everyone wants to beat to the club no-one fears. “Everyone has to start buying into what we want to do here,” said the Shire gaffer. “We don’t want to be hanging around the bottom end of the table, and while I think we do have players here who have a level of ambition, we do need to work harder in every match against every set of opponents. “We aren’t good enough to just turn up and expect to win. When we won at Civil Service Strollers at the start of October it felt as though the pressure was off a bit. But we haven’t picked up many points since them and we are still looking over our shoulder at the teams below us. Ure has dismissed the notion of pulling on his boots more regularly in a bid to help improve the team’s results. 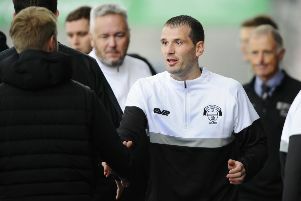 The manager made a very rare playing appearance from the bench on Saturday, entering the game at half-time and helping the team to win the second half 2-0. But he says his appearance on the bench was more to do with injuries and he will resist any possible temptation to lead a revival by example on the pitch. “There are no plans to play more regularly,” he said. “It was more down to a couple of players carrying knocks and not being quite ready for that environment. Shire will have to wait, though, before they have a chance to get things back on track. They have no fixture this weekend and won’t resume Lowland League action until a visit to Edusport Academy a week on Friday. “I think there would be no better time to get a victory,” said Ure. ”Some of our performances in games have been excellent but we need to apply ourselves in every game and not just we fancy it,” he said.